Enjoy a dazzling collection of diamond cluster earrings. Styled in unique combinations, from halo earring settings to traditional cluster styles, earrings are handcrafted from luxury precious metals. Choose from a range of cluster earring designs, including diamond halo earrings for a radiant and dazzling display. All earrings arrive beautifully presented in our luxury packaging, with worldwide delivery available. Combining luxurious rich blue sapphires with pristine white diamonds, the Starla blue earrings dazzle with sparkle and sophistication. Total gemstone weight shown below. The starla blue sapphire and diamond earrings dazzle with half a carat of blue sapphires, surrounded by 0.25cts of round brilliant cut diamonds in a halo effect design. 3 stone diamond earrings, created in a trilogy cluster design with three equally sized round brilliant cut diamonds. 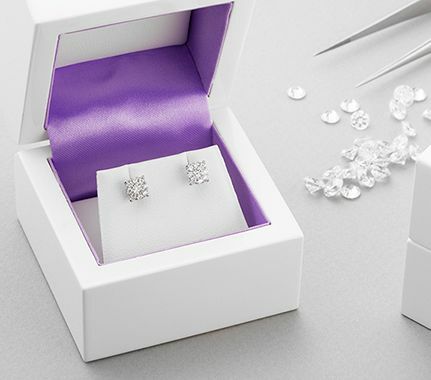 Each diamond is meticulously matched for perfection, styled into claw settings in an original three stone cluster design and beautifully presented and gift boxed for your special moment. Three equal sized diamonds. Trefoil design. Claw settings. Available in 18ct White Gold, Yellow Gold and Platinum. Weight stated is total for both earrings. Please allow 3-4 weeks for delivery. Also available in 100% ethical Fairtrade Gold. Pair of 3 stone diamond earrings, with squared claws, created in an elegant trilogy design with equally sized diamonds. 3 Diamonds in each earring. Equally sized diamonds Claw set in elegant design. Available in 18ct Yellow Gold, 18ct White Gold and Platinum. Total diamond weight specified. Approx 3 weeks delivery. A captivating pair of two stone diamond earrings, featuring a bezel setting with swirl design in an elegant graduated design. Unique swirl design. Two differing diamond sizes in each earring. Available in 18ct Yellow Gold, 18ct White Gold and Platinum. Total diamond weight specified. Approx 3 weeks delivery. Modern and beautifully styled two stone round brilliant cut diamond earrings. Rub over setting. Two sizes of diamonds. Round brilliant cuts. Available in 18ct Yellow Gold, 18ct White Gold and Platinum. Total diamond weight specified. Approx 3 weeks delivery. All of our diamond cluster earrings, feature multiple diamonds, set into traditional and contemporary designs. All earrings are hand crafted to order, created through a time-honoured tradition of jewellery manufacture. Diamonds are matched by expert eye, and available in many quality grades, typically G colour and SI clarity. Please allow approximately 3-4 weeks for your diamond cluster earrings to be made. We include beautiful luxury packaging, and insured courier delivery across the world, including UK, Ireland, Europe, USA, Australia and Canada. Cluster earrings add a greater expanse of diamonds to any ear with styles from drop designs, to halo styles, in most precious metal options. Making the ideal gift for birthday, anniversary, wedding day or Christmas, there are many occasions where earrings are the perfect gift idea.